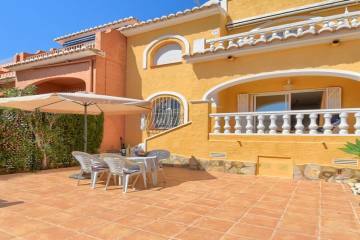 This property was recently reduced from 680,000 euros and has an outstanding open sea view over the bay of Javea. It has spacious living accommodation for a large family. Situated on a double plot in the lovely area of Entre Pinos, The property has the benefit of two entrances into the plot, one from Entre Pinos and the other from the upper slopes of Tosalet. Having been recently refurbished the villa has 3 bedrooms on the upper level and 2 on the lower level, and the lower level has its own kitchen and independent access. There are a 10x5mtre swimming pool and a summer kitchen.